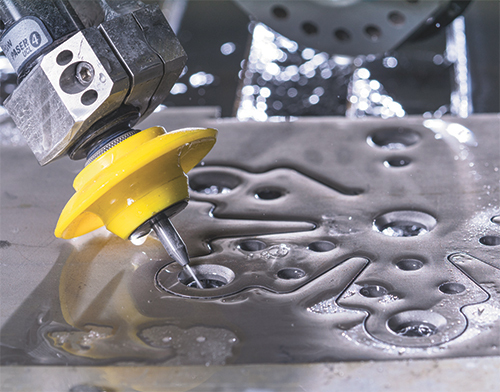 With ever-higher pressures available for waterjet cutting, fabricators can leverage the power to produce more precise cuts and save on abrasives. Operating at pressures reaching beyond 90,000 psi—90 times greater than pressure in a firehose—waterjet-cutting machines can produce supersonic streams the width of a human hair to precisely cut all manner of soft materials. Add abrasive garnet, and cutting power increases by as much as 1000 times to cut virtually any material in any thickness. But a waterjet-cutting machine is more than just water and abrasive. Responsibility for turning these components into a true shapecutting system falls to the machine, including the X, Y and Z table axes, cutting-head wrist axes, and material support catcher; the control system, including the programming software, operator interface, drive motors, and position and velocity feedback components; and the pressure apparatus, which includes the pump, cutting head and plumbing. In the early-1980s, typical high pressures in waterjet-cutting machines hovered around 36,000. Every decade since, pressure has increased, moving to 55,000 psi by the end of the 1980s and 60,000 psi in the mid-1990s. In 2004, Flow International introduced the HyperJet pump, rated at 94,000 psi, and the pressure ceiling had been raised again. With abrasive waterjet cutting, the abrasive particles within the waterjet stream erode the material and make the separation cut, with water as the abrasive accelerator. Higher pressure increases the kinetic energy of the abrasive particles contained within the water. As water and abrasive particles move faster, the jet diameter becomes smaller, and the jet’s power density and efficiency increases. Just as increasing wattage increases productivity in CO2 laser cutting, increasing pressure significantly improves waterjet productivity. Beyond the approach of raising pressure, many other alternatives to improve productivity have been attempted: increasing the horsepower, running multiple heads, using very aggressive abrasives and optimizing tool paths, to name a few. Of these, the only improvement that has held true is the optimizing of tool paths. Today, advanced waterjet-machine tools have tool-path optimization—speeding up on straight lines and slowing down on tight geometry—to control finished part anomalies caused by stream lag and ultimately shorten part cycle times. More advanced setups offer taper compensation where an articulated wrist tilts the cutting head slightly to compensate for the naturally occurring V-shaped taper produced by waterjet cutting. The other attempts did not produce efficiency gains for several reasons. Increasing horsepower results in faster cutting, but demands a proportional amount of additional abrasive, which adds costs. Adding heads splits the power between the heads, doing little for throughput and requiring the operator to ensure that all heads are cutting at precisely the same level. Using more aggressive abrasive increases operating costs by virtue of the high abrasive cost and also the rapid erosion of the mixing tube nozzle. In these cases erosion has been shown to occur five to 10 times faster. Intricate cut patterns, such as the one shown here, are possible through higher-velocity, thin-diameter waterjet streams, concentrating the cut area and allowing more cutting power from a given amount of abrasive. In simple terms, raising pressure improves efficiency—speeding up cutting and reducing cost per inch. At 60,000 psi, garnet abrasive accounts for more than half of a machine’s operating cost. Running continuously at 87,000 psi, the abrasive cost falls to less than half. Pierce time, the amount of time needed to drill a start hole, falls dramatically as well. The net result: shorter cycle times, meaning more parts produced per hour and more jobs completed per day. Thus, high-pressure-capable waterjet-cutting machines prove their worth for high-production environments and fast-turnaround requirements. Higher pressure also enables greater cutting detail due to the smaller stream diameters, making the process ideal for applications requiring precision parts. A smaller stream enables more intricate inside-corner cutting, for example. Pressure delivers productivity due to jet velocity. As pressure increases, so does the velocity of the waterjet stream. Once the stream exits the orifice, it has no pressure, as the pressure has been converted to velocity. 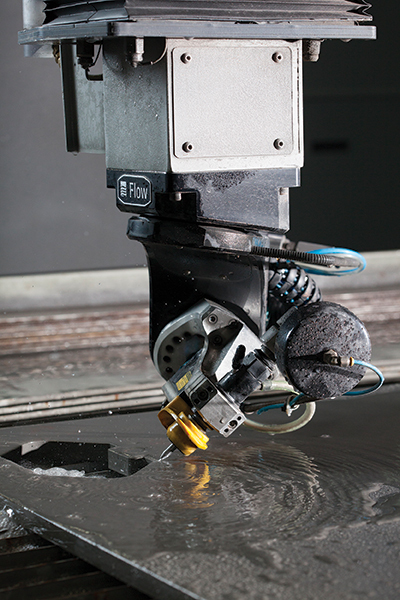 Faster and smaller waterjet streams mean faster-moving abrasive particles that carry more momentum, and remove more material more aggressively. Higher-velocity streams require less abrasive per length of cut because each abrasive grain can remove more material. The goal is to make the abrasive move as quickly as possible, so stream velocity is the key to efficiency. The only way to make a waterjet stream go faster is to raise pressure, not increase horsepower. Every waterjet pump has a maximum operating pressure, so to gain the benefits of a higher velocity stream, users need a pump designed to operate at higher pressure. Information for this article was supplied by Flow International Corp., Kent, WA; tel. 800/446-3569, www.flowwaterjet.com.